After String Of Collisions, Navy Will Broadcast Ship Coordinates In Busy Waters : The Two-Way U.S. warships typically run without transmitting Automatic Identification System, but the Navy is rethinking that after recent accidents involving the USS Fitzgerald and USS McCain. Damage to the USS John S. McCain is visible as the guided-missile destroyer steers toward Changi naval base in Singapore following a collision with the merchant vessel Alnic MC in August. That system, known as Automatic Identification System, or AIS, has been around for some 20 years and has long been required aboard all commercial vessels. It is used to share vital information among ships, including the type of vessel, its name, speed, location and whether it might be on a collision course with another ship. "It's important for situational awareness," says John Konrad, an author who has also captained commercial vessels. "AIS is certainly not the only means to avoid collisions at sea, but it's an important tool." But the Navy, even in peacetime, prefers not to draw attention to its movements. Until now, its ships have typically used AIS in receive-only mode — in other words, its ships can see other vessels using the system, but others can't see them, says retired Vice Adm. William Douglas Crowder, a former commander of the U.S. Seventh Fleet and a former deputy chief of naval operations. "It's all about operational security," Crowder tells NPR. "We don't want to be broadcasting our exact position to everyone." Crowder points to a number of websites — such as VesselFinder and MarineTraffic — that take in AIS signals gathered from satellites and post them on the web. Anyone with a laptop, he notes, can see the position of vessels anywhere in the world. 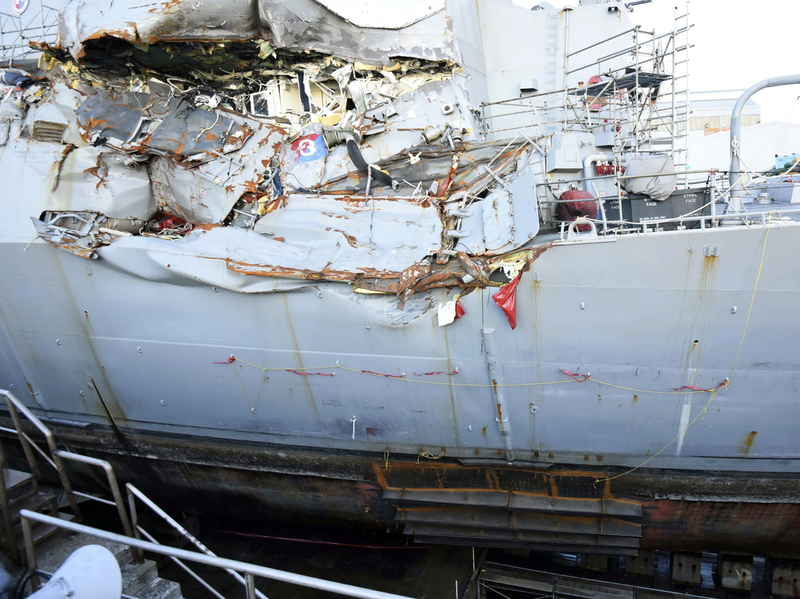 In June, the guided-missile destroyer USS Fitzgerald was involved in a collision with a Philippine-flagged container ship off the coast of Japan. Seven members of the Fitzgerald's crew were killed in the collision, which left a giant gash in the ship's side. Barely two months later, the USS John S. McCain, a sister ship of the Fitzgerald, was involved in a collision with the Alnic MC, a Liberian-flagged chemical tanker. That accident happened at the eastern entrance to the Strait of Malacca near Singapore, considered one of the busiest shipping channels in the world. Ten U.S. sailors were killed. In two other accidents this year, the guided-missile cruiser USS Antietam ran aground in Tokyo Bay. 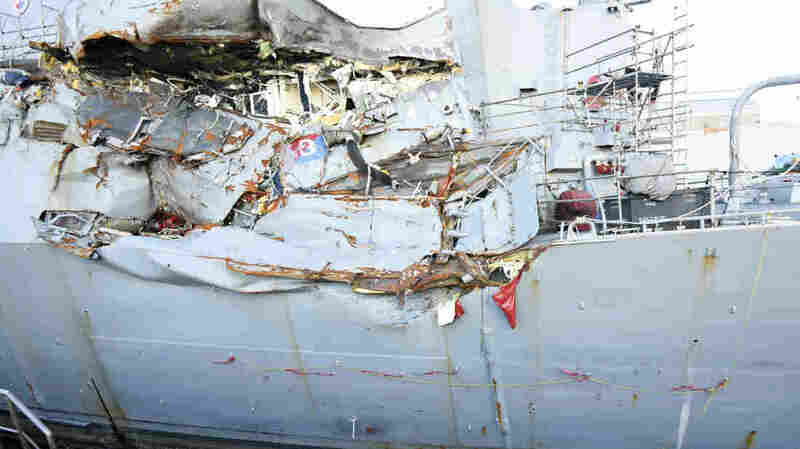 Months later, the USS Lake Champlain, also a guided-missile cruiser, collided with a South Korean fishing boat. 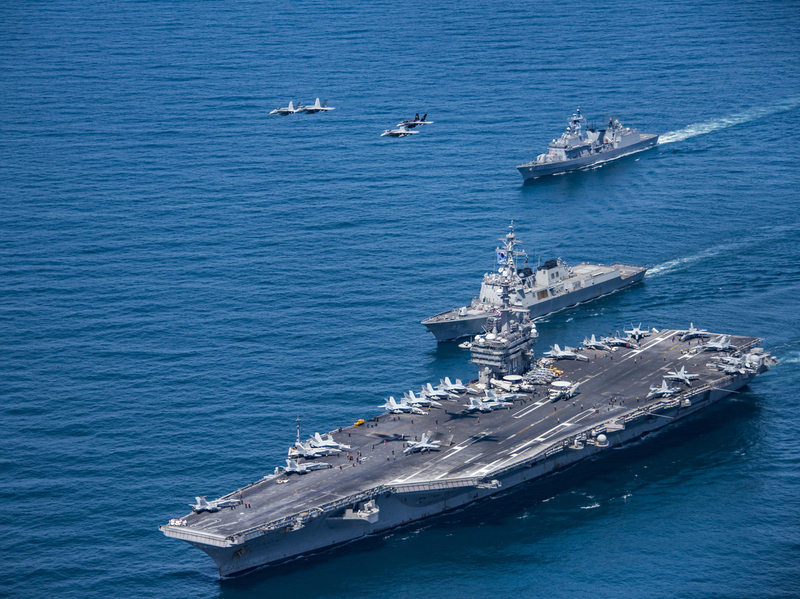 In this image released by the U.S. Navy, fighter jets fly over the aircraft carrier USS Carl Vinson and smaller ships as they transit the western Pacific Ocean in May. Those incidents prompted a review of naval operations. Earlier this month, Vice Adm. Thomas S. Rowden, the commander of the U.S. Surface Fleet, issued an internal directive that ordered more predictable watch schedules and sleep periods for sailors. The new orders also change the long-standing practice on AIS, requiring commanders to transmit as well as receive while steaming in "any traffic separation scheme and/or any high-density traffic area" unless ordered otherwise by the fleet commander, according to Crowder, who has seen the directive. "I think it's an acknowledgment that we could use [AIS] and ... reduce the chance of a collision," says retired Vice Adm. Peter Daly, a former deputy commander and chief of staff of the Navy's Fleet Forces Command. Daly, who now heads the U.S. Naval Institute, is also a former commander of the USS Russell, another ship of the same class as Fitzgerald and McCain. The USS Fitzgerald sits in dry dock in Yokosuka, Japan, for repairs following a June 17 collision with a cargo ship near Japan. 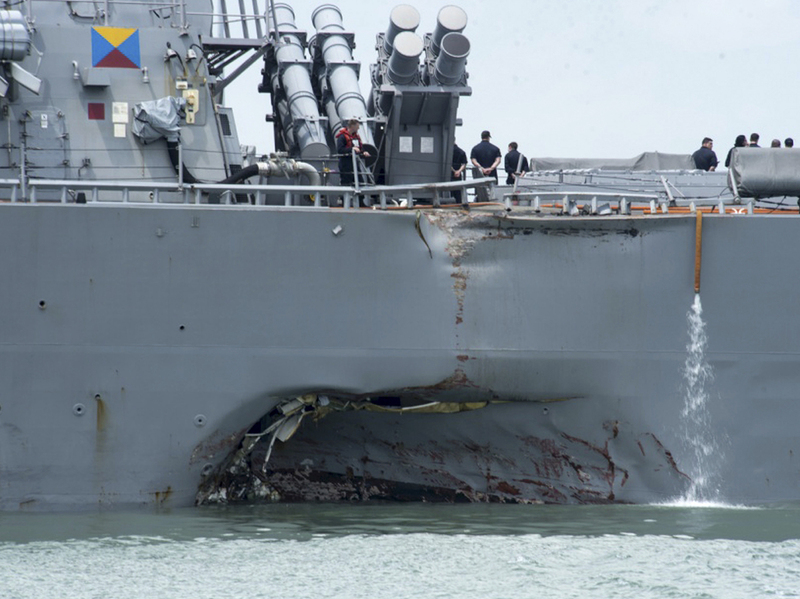 While it isn't clear whether the Fitzgerald was transmitting AIS at the time of the June collision, the McCain was not, according to Singapore's Transport Safety Investigation Bureau, or TSIB, which investigates air and sea accidents. It says both the McCain and the Alnic showed up on port radar, though only the tanker appeared on AIS. Radar — standard equipment on all large vessels — is still the primary electronic aid in collision avoidance. Even so, a blip on a radar can be ambiguous. And Daly notes that the fast and highly maneuverable Arleigh Burke-class destroyers, such as the Fitzgerald and McCain, are especially difficult to see on radar. They appear much smaller on a radar screen than other similar-sized vessels, he says, adding that they are "definitely designed to present [what's called] a reduced radar cross-section." "It's not stealth, but it's using some of those techniques," Daly tells NPR. For the crew and captain of a commercial vessel, a Navy ship that doesn't show up on AIS and is difficult to see on radar can compound a uniquely difficult situation when the ships meet at sea, says Konrad, who now runs gCaptain, a news service focusing on the marine industry. Konrad says that as a captain, encountering a naval vessel was one of the biggest challenges. "We always had a lack of confidence in [their] maneuvers," he says. "A merchant ship is big and slow and doesn't typically do anything too surprising," Konrad says. On the other hand, warships "can maneuver fast. In a couple of minutes, [they] can make a radical course change." The Navy has yet to release details of its investigations into the accidents involving the Fitzgerald and McCain. Although the use of AIS — or the lack thereof — is unlikely to fully explain what happened, Crowder says he "wouldn't be surprised" if it turns out to be a factor. Operational security aside, "when you get close to a port, where people can see you from the hotels in Singapore, it doesn't make a whole lot of sense to not have [AIS] on," he says. Both retired admirals caution that it's important not to focus on a single factor, such as electronics, when addressing the root cause of the recent collisions. "I think it's no secret that a lot of things had to go wrong for this to happen to these ships," he says.